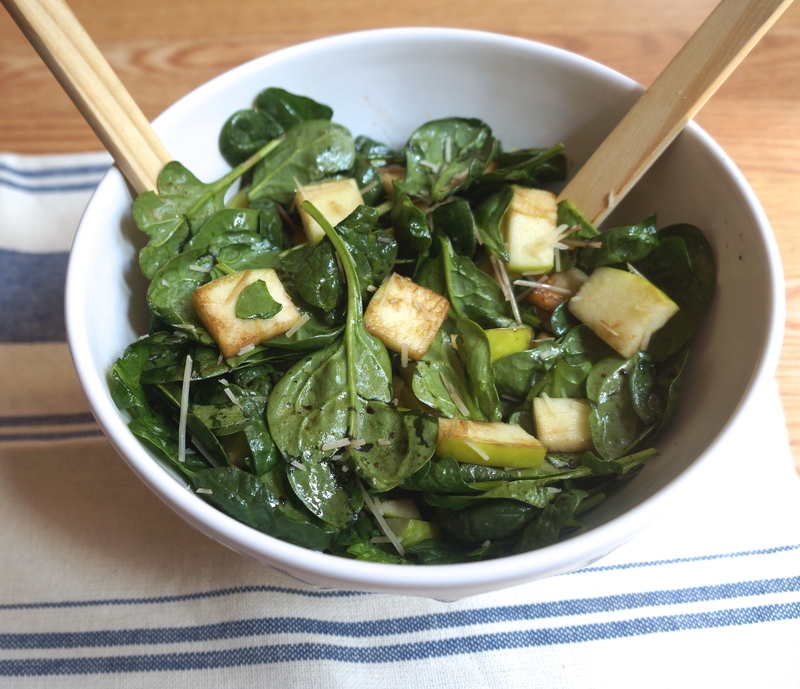 Everyone has a go-to, simple salad that they love to throw together, and this one is brought to you courtesy of Ashley Higgs. Last month Ashley had some guests over for a pasta-making party, and she served this exquisite, unfussy salad on the side. 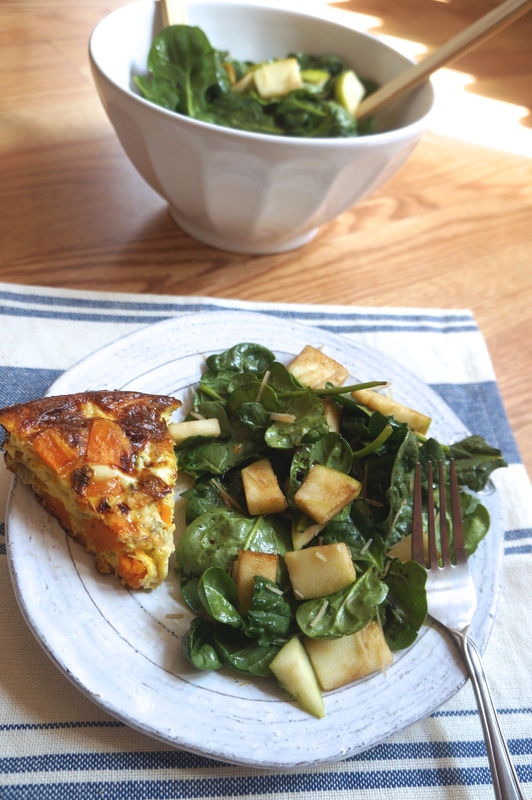 Since this is a simple dish, a high quality cheese goes a long way. In other words, this would not be the time to pull out the green shaker of grated parm (not that there ever is). Additionally, I highly recommend a good balsamic vinegar (made with grape must), rather than a cheap, imitation variety. 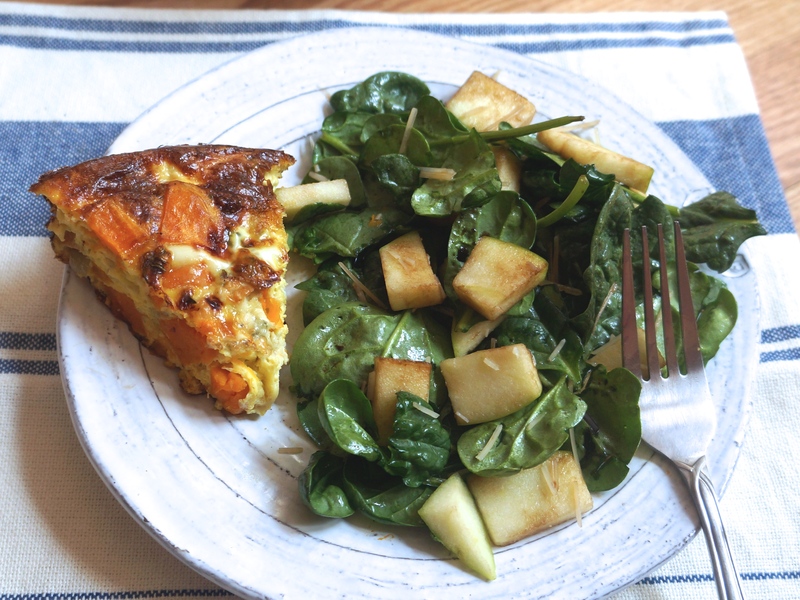 At home, I paired this leafy masterpiece with a sweet potato and blue cheese frittata, but the mellow flavors of the salad compliment just about any dish. Method: Combine all ingredients in a large serving bowl, and toss until mixed. Serves 4 as a generous side salad. While my previous two recipe posts indicate otherwise (here and here), there’s actually a lot more to my diet than just steel cut oatmeal. In fact, in an effort to cook more from cookbooks, I try to make at least 2 or 3 new recipes a week. So today I’m sharing a few of my favorites. Some are new discoveries, some are old standbys, but all are absolutely spectacular! Curried Lentil Soup from Mollie Wizenberg // The Bon Appetit article that accompanied this recipe was required reading for my Food Writing Class, and I have made this recipe MANY times since then. Chickpea puree lends a delightful heartiness to this Eastern Mediterranean inspired soup, making it quite possibly my favorite lentil recipe to date (and that’s saying something)! As you can tell from the multiple Instagrams, warm whole grain toast is the ultimate companion to this meal. 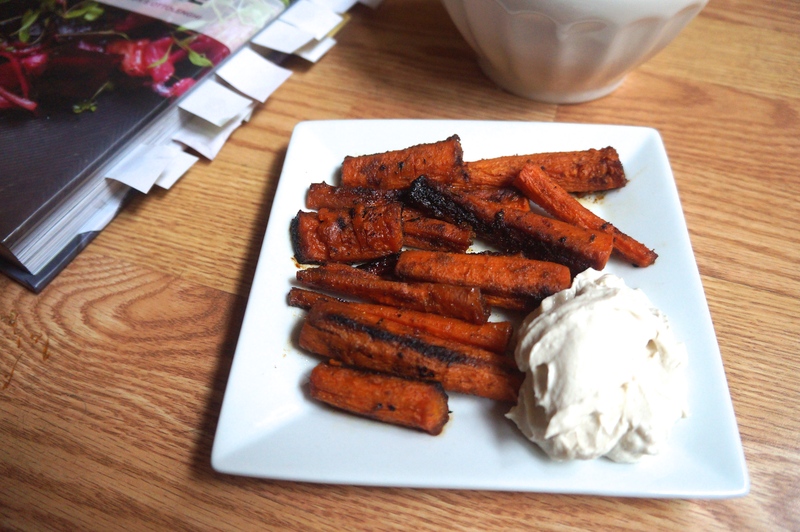 Honey Roasted Carrots with Tahini Yogurt from Yotam Ottolenghi // There are so many delicious recipes in Plenty More, that I am almost embarrassed to admit that a humble side dish is my favorite. But it’s too good. Thanks to this recipe, I scarfed down 12 large carrots in only two sittings, and then polished off the tupperware of the remaining tahini yogurt dip. Unfortunately for my pale winter skin, I didn’t turn orange. Guess I’ll have to make some more! Salmon Cakes with Lemon-Caper Yogurt Sauce from Giada de Laurentiis // True story: this recipe singlehandedly got me over my aversion to canned fish. (Giada calls for canned salmon in the cookbook version of this recipe.) Ashley copied down the recipe as soon as we finished eating, which I’m pretty sure is a good sign that dinner was a hit. I made a few substitutions (Kashi Original 7 Grain Crackers instead of Saltines, nonfat plain Greek yogurt instead of mayo) but the final result was completely delicious! 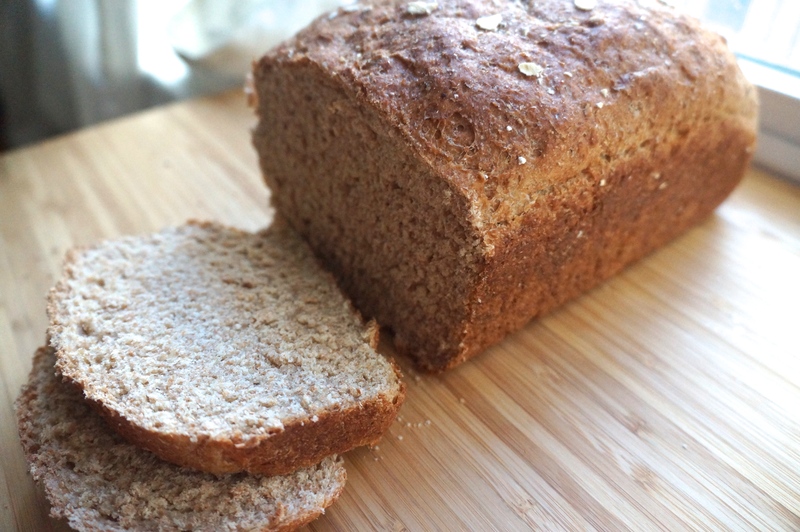 100% Whole Grain Bread from Ashley Higgs // Okay, this recipe isn’t actually new to you. I blogged about it almost exactly a year ago. But in recent weeks I have been on a bread baking kick, and this is the recipe that I use every single time. If you haven’t had a chance to make it yet, consider this a friendly nudge! What are some of your favorite no-fail recipes? The fact that I live exactly 0.3 miles away from a Whole Foods Market is both a blessing and a curse. With a paradise of healthy ingredients right around the corner from my apartment, I’m often tempted to stop by the store multiple times a week so that I can try a new recipe. But it’s adding up. Rather than face the prospect of a rapidly dwindling bank account, I have been trying to cook more from what’s in my pantry, rather than constantly getting lured into the grocery store. Above is one such dish I made this week. I had a small Tupperware of chopped bell peppers and onions in the fridge (the remaining bits that didn’t make it into my weekend omelet), so I roasted them up with a forgotten sweet potato, along with ample chili powder, paprika, and cumin. 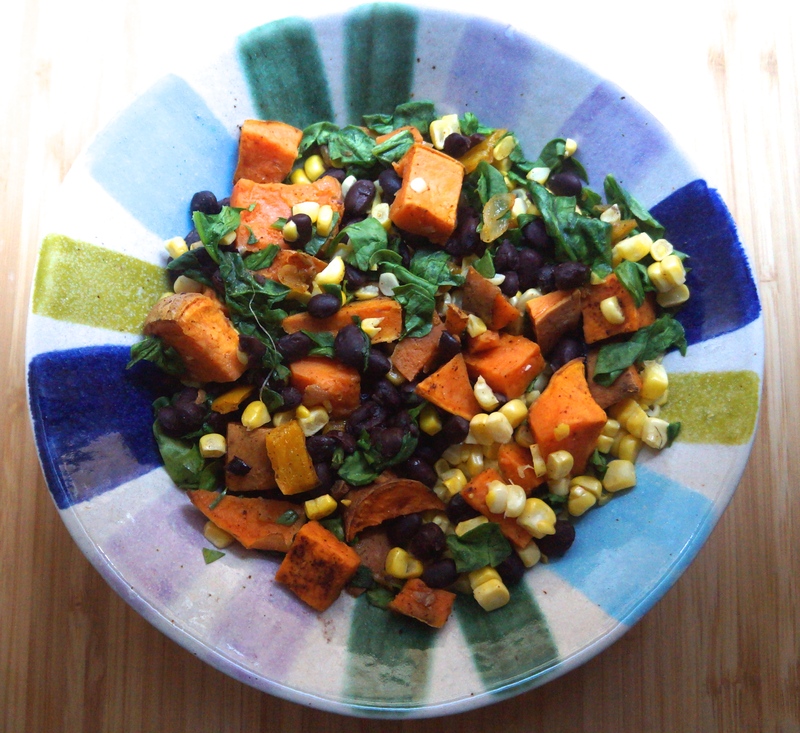 For protein, I tossed in a can of black beans (a pantry staple! ), and I finished the dish off with corn from the farmers market (thank you, prepaid gift card) and baby spinach (another omelet remnant). Getting creative in the kitchen is probably the best way to stretch your grocery dollar. But if you’re not quite comfortable enough to start experimenting, sometimes it helps to have a guide. Enter the Good and Cheap cookbook. This cookbook is a FREE downloadable PDF with recipes for people on a food-stamp budget (roughly $4/day). Unlike most resources for people on nutrition assistance programs, this cookbook is filled with beautiful, color photographs, and is actually a treat to flip through. The book itself isn’t a “healthy” cookbook—in fact, butter makes appearances much more frequently than this dietitian is comfortable with. However, the recipes are largely plant based, often giving fruits, vegetables, and whole grains the starring roles. Additionally, the cost per serving is given for each recipe. The cookbook was created by Leanne Brown, in fulfillment of a Masters project for the NYU food studies program. As someone that graduated with a similarly obscure foodie graduate degree (whoop, BU Gastronomy! ), I have so much respect for Leanne and the amazing project that she undertook. Like Leanne, I believe that cooking is one of the most effective (and more importantly, fun!) ways to take control of your health. And if you can do it on $4 a day? Even better! What’s your favorite budget-friendly recipe? 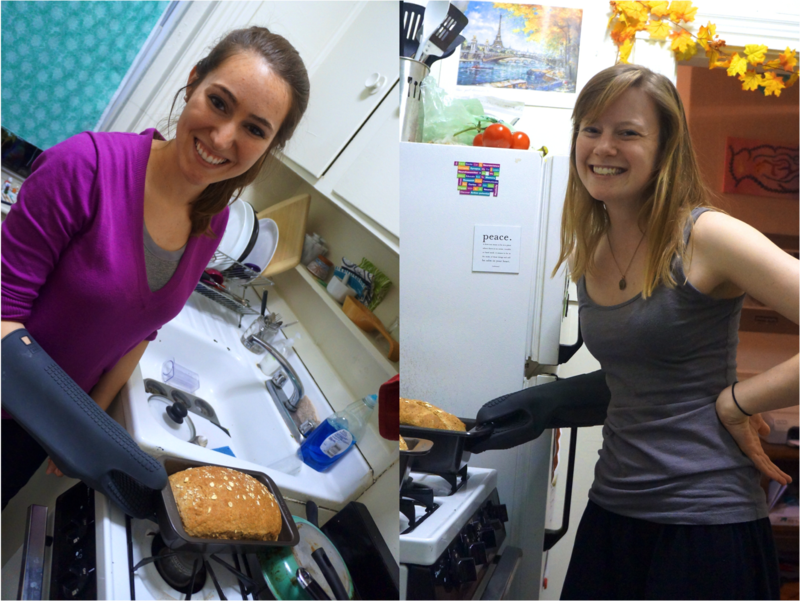 Recently, my friend Ashley invited me over to teach me how to bake bread. Her recipe is 100% whole grain (using both whole wheat flour and quick oats), so I was worried that the resulting product would be as dense as a brick, and as dry as cardboard. However, as her little Allston apartment filled with the heavenly aroma of fresh baked bread (a must, if you have never experienced this smell), I knew I was in for a treat. 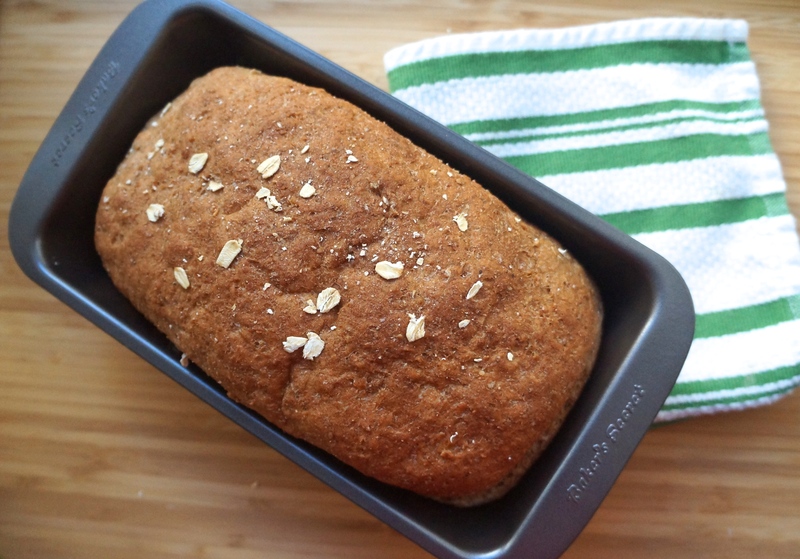 This recipe is the softest, fluffiest whole grain bread I have ever tasted! The sugar (we used agave) is necessary to feed the yeast and create an airy texture, while the olive oil provides a moist texture and a rich flavor. And best of all, the recipe couldn’t be simpler. Allow all dry ingredients to come to room temperature. In large bowl, stir all dry ingredients together for 1 minute. Add the olive oil, agave (or honey), and about 1 cup of water. Stir till mixed then knead for 6-8 minutes. You may have to add more water, but do so carefully – different flours respond to moisture differently. If you add too much water, that’s okay! Just add more flour in small increments. Add small amounts of water or flour as necessary. By the end of the kneading, the consistency of the dough will change and should feel moist but not sticky or dry. Cover bowl with a damp cloth and leave the dough to rise for 30 minutes. Dough should approximately double in size. Preheat the oven to 350 F.
When finished baking, take bread out of bread pan immediately and put on a cooling rack. Enjoy! (Store in airtight container or bag and in the fridge if not eaten within 3 days). 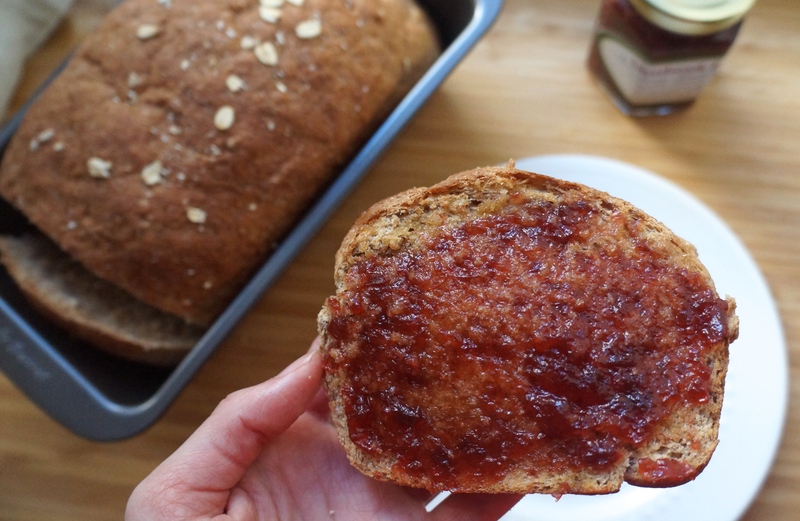 I topped my bread with Strawberry Rhubarb jam from the farmers market.